Well, it’s been a busy few months in our Institute’s postgraduate programme, so here’s a roundup of what’s been going on. As some of you know – if you’ve been watching for our PhD positions being advertised on www.FindAPhd.com – we are currently recruiting for a number of postgraduate positions within our Institute, aiming to have our new 1st-year PhD researchers start in October. During January and February we carried out a recruitment exercise which has filled most of our positions, but we still have a couple available. If you have already graduated or are about to graduate with an excellent degree in physics, engineering or other relevant discipline, then please get in touch with us, and apply via our ‘Join Us’ page. Our Institute works with many of the biggest labs and projects around the world, offering our researchers exciting and rewarding work with good prospects for employment afterwards. 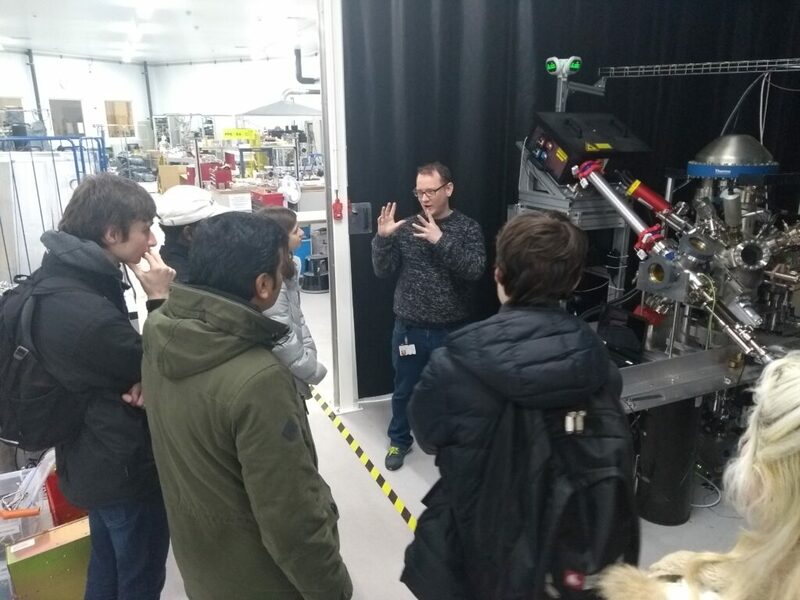 Undergraduates visit the Daresbury vacuum science laboratory. Wednesday 14th February saw this year’s National Particle Accelerator Open Day, a suitable day for those already in love with particle accelerators and those who – after seeing one – might fall in love too! The 2018 Open Day was jointly sponsored by the Cockcroft Institute, STFC’s Accelerator Science and Technology Centre and of course the IOP’s Particle Accelerators and Beams Group, and was hosted at our Daresbury Science and Innovation Campus (where the Cockcroft Institute has its main site) here in sunny Cheshire. Alexandra Alexandrova talks about transferring research to industry. 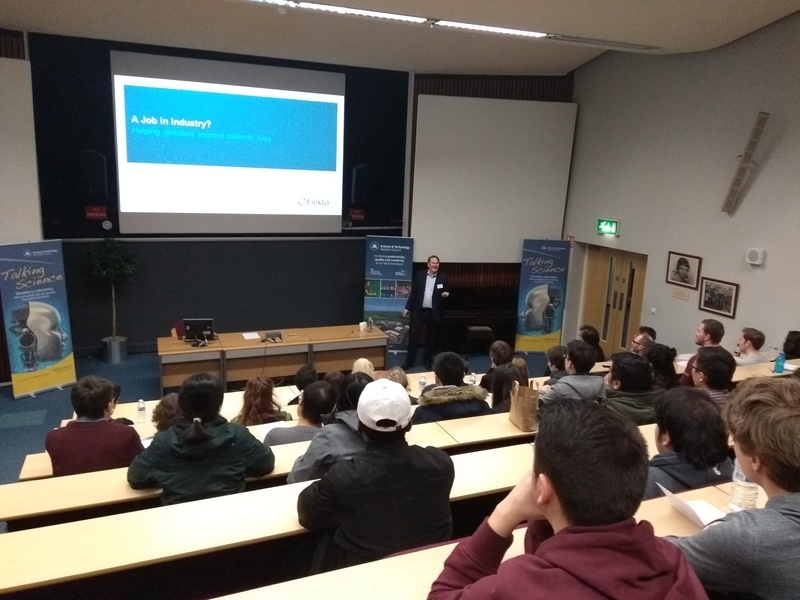 Around 70 undergraduate students – mostly physicists and engineers in their 2nd or 3rd year of study – were hosted for a full day of talks and tours as in previous years’ events. 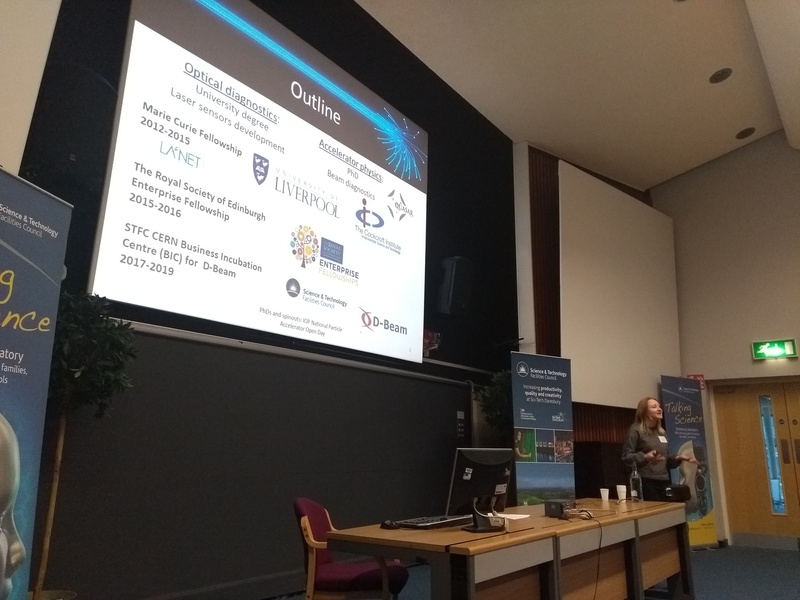 Our own Alexandra Alexandrova – who leads the D-Beam spinout our Institute – gave a talk discussing how to translate research into industrial application. You can read more about the Open Day in the IOP Particle Accelerators and Beams’ forthcoming newsletter. John Allen from Elekta talks about working in industry. As you will have seen in an article posted a couple of days ago, we have also just held our first summer school dedicated to the industrial applications of particle accelerators. Several of our research programmes have an aim that our research goes into practical uses such as radiotherapy, materials processing or imaging, and our current ASHE programme involves a number of UK companies that have partnered with us to deliver the instruments of tomorrow. You can read more about the ASHE school here. Many of our postgraduate researchers have recently presented their work at IPAC – the principle conference for our field – which this year was held around the beginning of May in the beautiful city of Vancouver, Canada. Kay Dewhurst is one of our postgraduates who attended, and you can read about her experience of the conference here. All our presentations at the conference will shortly be freely available at the conference publication website, JACOW. You can also read about our recent research via our publication site, ePubs. We are always on the lookout for talented individuals to join us to help bring about our world-leading research programme. If you think you have the right attributes to join us, then please get in touch via our recruitment page; positions become available throughout the year.